Is there still value in the KrisFlyer Star Alliance award chart? 22 Comments on Is there still value in the KrisFlyer Star Alliance award chart? One of the great benefits of accumulating KrisFlyer miles is not only for redemption on Singapore Airlines and SilkAir flights, but also the option to secure award seats on other Star Alliance airline flights and those of SIA partner airlines. In this article we’ll take a look at the Star Alliance options and leave partner airline redemptions for a later date. Cast your minds back to November last year when we were reporting on the devaluation of the KrisFlyer Star Alliance redemption chart. At the time we promised ourselves to have a good look at the new chart to check if there were any ‘sweet spots’ and good value options left and we’ve finally got round to it! Remember the chart pricing is for round-trip awards, a one-way ticket requires half the stated mileage. Why do a Star Alliance redemption? Singapore Airlines undoubtedly has some of the best cabin products and service in the business, pretty much whichever class you’re flying in, so why would you use your KrisFlyer miles to fly on a Star Alliance airline instead? When a saver award is not available on Singapore Airlines for the route and date of your choice. When your routing or destination is not served by Singapore Airlines, or is better served with another carrier. When the miles rate is simply much better value, the so-called ‘sweet spots’. To try out the cabin product of another airline. Do remember for the latter category though to make sure you are still getting good value for your redemption. For example if you want to try out Lufthansa First Class then flying from Singapore to Frankfurt for 129,000 miles is not a good redemption. The Middle East to Europe for 60,000 miles, Europe to South Africa for 70,000 miles or even Europe to the USA for 90,000 miles represent much better value. Are there any ‘sweet spots’ left? Yes there certainly are, though not all are terribly useful for those based in Asia. We found a number of excellent deals if your travels take you to Europe, the Middle East, Africa or the USA / Hawaii. A few things surprised us too. For example almost everyone knows it now costs 85,000 KrisFlyer miles to fly in Business Class from Singapore to Zurich. Not many people realise though that you can take advantage of a ‘sweet spot’ between the Middle East and Europe to reach Zurich for 70,000 KrisFlyer miles in Business Class. That’s because the Business Class Star Alliance redemption rate between the Middle East and Europe is only 25,000 KrisFlyer miles. The Singapore Airlines site won’t let you book this itinerary as a single ticket for 70,000 miles because it is an invalid routing but you are free to book the two legs separately. Just remember to build in suitable contingency, or perhaps plan a night or two in Dubai to break up the journey. In another example not many people realise you can take a cheap Scoot flight from Singapore to the Maldives (S$191) for a couple of days in paradise then continue your journey to Europe from there on Turkish Airlines in Business Class for 47,500 KrisFlyer miles. That’s a significant saving on the 85,000 miles a Singapore Airlines or Star Alliance Business Class saver redemption to Europe would cost you and potentially opens up a much wider choice of European destinations than SIA offer given the extensive Turkish network. It’ll also buy you some time in the excellently rated Turkish lounge in Istanbul. It’s important to note that we haven’t specifically assigned all the examples shown into one of these two categories – it’s fairly obvious where a definite ‘sweet spot’ exists but many other routings would probably be best called a ‘good value’ redemption. 15 hours in Lufthansa First Class for 90,000 KrisFlyer miles is a ‘sweet spot’, 20,000 KrisFlyer miles to fly East to West Coast USA in Business Class is probably better described as ‘good value’. Remember that since Singapore Airlines no longer applies a fuel surcharge on award tickets you may find yourself paying quite a bit more cash than you would normally expect on top of the KrisFlyer miles rate to secure Star Alliance redemptions. Lufthansa for example still apply a steep fuel surcharge, in some cases adding hundreds of dollars to your miles cost. It’s not all bad news though – United redemptions within North America and Hawaii carry only US$5.60 of additional cost on top of the miles rate, and during our searches we also found that Ethiopian Airlines does not add a fuel surcharge to award tickets. Poor value in Economy Class or First Class where the mileage rates are higher than a saver award ticket with Singapore Airlines (38,000 and 115,000 miles respectively), however the Business Class redemption rate matches the SIA saver award rate at 85,000 miles one-way. That means there’s an opportunity here to redeem on another airline like Lufthansa, Swiss, Turkish or Thai to Europe when a saver redemption on SIA is not available or you’re flying somewhere a bit more obscure. 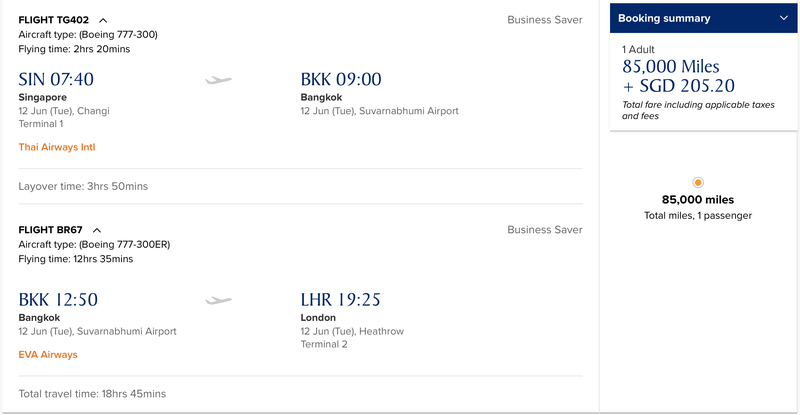 There are no Business saver awards with Singapore Airlines to London this coming Thursday, so why not book this Thai Airways / EVA Air routing via Bangkok? When you’re heading to London don’t forget to check flights to and from London Gatwick – Turkish provide a good option here. Heading slightly off the beaten track doesn’t mean ditching Singapore Airlines either, you can combine an SIA and Star Alliance award flight if you wish. The Star Alliance redemption rate then takes precedence, but to Europe it’s the same in Business Class anyway. Since North America is a single redemption zone on the KrisFlyer Star Alliance award chart it’s far better value to use your miles to fly between Europe and the West Coast of the USA or Canada (like Los Angeles or Vancouver) than it is to the East Coast (like Boston or New York) as the mileage rate you’ll pay is the same in both cases. A great rate in Economy Class here, a definite ‘sweet spot’ if you are able to exploit the maximum distance between these zones (e.g. Eastern Europe to West Coast USA). The non-stop flight with LOT Polish from Warsaw to Los Angeles will only set you back 27,500 KrisFlyer miles in Economy Class. It’s even longer than their Singapore to Warsaw flight, which costs 45,000 KrisFlyer miles in Economy! Business Class isn’t bad at 65,000 miles – not great value from Western Europe to the East Coast of the USA where flight times are around 7-8 hours but again if you head all the way to the West Coast of Canada or the USA there’s good value here. First Class is pretty much restricted to Lufthansa on this route, remember that Swiss First Class redemptions are blocked to KrisFlyer members. First is of course an aspirational experience, which can include the Lufthansa First Class Terminal at Frankfurt, but at far superior value on this routing compared with say an Asia to Europe redemption. Not exactly a ‘sweet spot’ but Lufthansa First Class from Frankfurt to San Francisco is significantly fewer miles than their Singapore to Frankfurt flight in this cabin (129,000). Expensive at 27,500 miles in business, but 12,500 miles in economy can make sense for longer or more costly routings. More often though it doesn’t make sense. Europe is relatively cheap to fly around, especially booking well in advance with a number of low-cost airlines and competitive fares from the full-service carriers too. As always the key is to know the cost and get good value for your miles. Here are a couple of examples where that’s not the case. Since you can book this flight as a firm ticket for €157.94 and Singapore Airlines are asking 12,500 KrisFlyer miles and €82.94 it’s valuing your miles at only €0.006 each (about 0.9 Singapore cents per mile). That’s really poor value. Ok so if a short hop isn’t worth it, what about a longer flight? Again let’s look about 3 weeks from now and fly the longer 3-hour flight from Malaga to Frankfurt. This immediately looks a lot better – lower taxes, the same miles rate and a much longer flight. Just a quick check of the price of a revenue ticket is all you’ll need to reassure you that this is a good deal. Hope you didn’t rush to book it using miles! That’s right – this 3 hour flight only costs €84. Including taxes, with checked baggage. Your 12,500 KrisFlyer miles are saving you just €33, a value of €0.0026 per mile (0.4 Singapore cents per mile). A truly awful redemption. Remember you can offset the cost of any Singapore Airlines or SilkAir cash ticket using KrisFlyer miles and achieve a fixed value of 1 cent per mile. We don’t even endorse doing this but it must be regarded as the minimum value you should ever achieve when redeeming. Because Iceland is in the Europe zone (though SIA do not mention this in their Star Alliance Award Chart) there are some good deals to be had to and from Reykjavik. For reference this flight comes in at about S$592, so although you’re still paying about S$200 in taxes with the redemption ticket you will still get a value of about 3 cents per mile here. You can get maximum value from flying within a single redemption zone by choosing destinations at the extremes. Greece to Iceland (pictured) is a near 8-hour journey but still costs the same as a 1-hour hop from Paris to Frankfurt – 12,500 KrisFlyer miles. It’s important to note that the First Class rate is not relevant here as domestic First Class in North America is charged at the Business Class rate on the Star Alliance redemption chart. That means we’re only talking about 12,500 or 20,000 miles in this zone. As we mentioned above, the ‘sweet spot’ is often achieved by exploiting the size of a single redemption zone. If you want to fly from Newark to Boston on United in Economy Class a month from now, a flight with United on this short 1-hour flight will set you back S$134. The same flight using KrisFlyer miles costs 12,500 miles + US$5.60 (c. S$7.56). That’s getting you about 1 Singapore cent value per mile, which is very poor. On the other hand if you wish to fly from Washington to San Francisco next month in Economy with United the cheapest itinerary on 18th July costs S$428 for the a 5 hour 45 minute flight. The KrisFlyer cost is still 12,500 miles + US$5.60 (c. S$7.56)! That’s a very respectable value of 3.4 Singapore cents per mile and we would definitely recommend using KrisFlyer miles in this case. In Business Class it’s the same story, target the longer trips between East Coast and West Coast to get the best value for the very reasonable 20,000 KrisFlyer miles cost. Remember these domestic North America flights take up to 6 hours and Singapore Airlines charge the same KrisFlyer rate to fly in Business Class for 2.5 hours from Singapore to Bangkok. An SIA flight from Singapore to Perth is the exact same distance as one from Washington to Los Angeles, but costs 58,000 KrisFlyer miles in Business Class not 20,000! Another thing you’ll notice is the remarkably low taxes and fees associated with North America redemptions – it’s always just US$5.60 per sector. Again you can take good advantage here of the single redemption zone for North America by flying to Hawaii from the East Coast of the USA or Canada (or vice versa) for exactly the same number of miles as the much shorter journey to or from the West Coast of the USA. An economy redemption lasting over 9 hours for fewer miles than an SIA Economy redemption from Singapore to India (18,500 miles) is insane value. For the Business Class examples let’s take a look at an average value redemption between the West Coast of the USA and Hawaii and a very good value one linking the East Coast of the USA. Here the value for a 5 hour 46 minute business class flight is reasonable at 30,000 miles, however for the same mileage cost a much longer 9-hour flight to New York is available. This flight is not far off the same distance as Singapore to Auckland – superb value at 30,000 KrisFlyer miles in Business Class. Good value here for some long flight segments, again best value is achieved by flying towards the far edges of each zone. For comparison Sao Paulo to Chicago is the same distance as Singapore to Moscow – a route where Economy and Business Class redemptions on Singapore Airlines cost 38,000 miles and 85,000 miles respectively. No longer a steal in First Class since the Star Alliance award table devaluation when the rate jumped from an insanely low 35,000 miles to 60,000 miles, however the Business Class rate of 25,000 miles remains very competitive for a trip of this length. Better still for a true ‘points hack’ you can combine this with a Singapore Airlines Business Class award between Singapore and Dubai for 45,000 miles. That gets you to or from Europe in Business Class for 70,000 KrisFlyer miles (15,000 less than the usual rate). You can even split the flights by a few days and create your own stopover in Dubai if you wish. A bargain here in Business Class and First Class, given the distance involved. Good one-stop options in Business Class exist with Lufthansa, Swiss and Turkish. An example itinerary from Dubai to Los Angeles via Zurich comes in at just 69,000 KrisFlyer miles – a remarkable deal for over 19 hours in Business Class. For First Class you’re limited to Lufthansa on this route, as KrisFlyer members are not entitled to Swiss First. Availability is scarce and often quite last minute, but we found an example from the Middle East to Chicago in Lufthansa First Class on the Airbus A340-600 then the new Boeing 747-8 for just 90,000 KrisFlyer miles. The second flight in this First Class itinerary costs 95,000 KrisFlyer miles in isolation, while the first one would be 60,000. Combine them and voila – 90,000 miles in total. A true ‘sweet spot’. Fantastic cheap redemption rates for such long flights here with 45,000 miles in Business Class the standout option. You can use airlines like Lufthansa, SWISS, Turkish and Ethiopian on these routes, not forgetting South African Airways. Ethiopian is your low taxes option to South Africa. No fuel surcharge on redemption tickets means parting with much less cash alongside your miles. While the KrisFlyer site doesn’t know the aircraft types for the flights shown above they are both operated by the Airbus A350. For Lufthansa First Class – not a bad rate at all for a 10-hour flight. Here you’re looking at 70,000 KrisFlyer miles. Both Economy and Business Class are very competitively priced between these regions, where a travel time of at least 8 hours is involved. Let’s take a look at a couple of Business Class examples. Between Perth and Auckland with Air New Zealand for 12,500 KrisFlyer miles in Economy Class or 28,000 KrisFlyer miles in Business Class. This flight is operated by the 787 and takes over 6 hours – excellent value. Despite a devaluation for many Star Alliance award tickets late last year there are still plenty of good value ways to use your KrisFlyer miles. Sure some of them are a long way from home but keep them in mind, as you never know where your travels will take you. Europe to the Maldives in Turkish Business Class for 47,500 miles. A great way to have a two-centre holiday before returning to Singapore refreshed and relaxed. The Middle East to Europe in Business Class for 25,000 miles. Combined with a Singapore Airlines Business Class award to Dubai for 45,000 miles that gets you to Europe in Business for 70,000 KrisFlyer miles (15,000 less than the usual rate), with a couple of nights in the sandpit en-route if you so choose. Hawaii to the East Coast of the USA for 30,000 miles. You just can’t argue with 9 hours in business class for this price. We don’t know exactly when we’ll manage to do this one but full marks for value. Europe to South Africa in Lufthansa First Class for 70,000 miles. We loved our trip to beautiful South Africa earlier this year and will definitely return. Since we’re unlikely to ever need to fly from the Middle East to the USA for 90,000 miles in Lufthansa First Class (an incredible bargain), this routing looks like the one for us. Remember you can book Star Alliance awards for yourself and your partner / redemption nominees, so next time you’re planning a trip even if it involves some travel on the other side of the world, consider whether using your KrisFlyer miles this way might secure you some really good value. Thanks Ken, appreciate the feedback and hope these kind of articles prove useful for people. We actually enjoy writing these ones as we discover things we never knew or spotted before ourselves! Brilliant article. I’m UK based but collect with SQ so these types of articles are very useful. Love the level of detail that goes into all your content! Thanks Chris! There are certainly some nice options for using KrisFlyer miles in your part of the world. Glad it helps. Hey Andrew.. You “missed” the “sweetest spot” and mother of all Star Alliance redemptions… and yes, the inverted commas in “missed” means I’m sure you know that 360,000 Miles gets you a RTW redemption in First/ Suites Class on any Star Alliance airline-combination (Ts & Cs, of course).. (and yes, I’m sure your above article wasn’t meant to cover this, I’m just ribbing you).. that’s just a sneeze (8,000 miles more, to be exact) than 2x Return Business Savers (from SIN) to either SFO or LAX! Hi Ken, yes I reckon that’s an article in its own right but was probably worth a mention somewhere here! Accumulating miles is sooooo difficult.. remember I mentioned I’ll be trying new RJ in Dec..? Well that was before I decided to take advantage of KF’s Spontaneous Getaways! I’m now 56,000 miles poorer than I was a couple of days ago, but will be trying RJ for the first time in Jul instead of Dec! Ha! I think your article is a gem! I’m tempted to purchase krisflyer miles using the Voyage Card. I plan to travel from SIN to SYD or LAX later this year, any advice on how i can maximise my miles redemption for Biz class flights? Thanks in advance. Is it possible to redeem first class to other parts of Europe say Madrid via Zurich using the same amount of miles? Im thinking of trying the new 2017 Suites and only SIN-ZRH will be upgraded. I can’t seem to find this type of route from the website. Thanks in advance. Yes you can do this but because there is no First Class Intra-Europe on those routes (like ZRH-MAD) the website wont price it as one trip like it will if you fly Business Class all the way. For example SIN-ZRH F Saver (SQ) is 115,000 KF miles + ZRH-MAD J Saver (Swiss) under Star Alliance is 27,500 miles = 142,500 miles. You can call SQ and ask them to make the booking under a single itinerary. As it now involves a Star Alliance carrier you’ll pay the Star rate for the highest cabin class (129,000 miles). The website can’t cope with doing this mixed class booking so you’ll have to call. The key here is to find the availability you need sector-by-sector then call to book. Thanks Andrew for the information. Great article, wish I had seen it before I did my own research. Having said that, you might have missed out one. Southwest Pacific to Southwest Pacific: Potentially you could fly from Perth to Tahiti via Auckland on Air New Zealand. This is a 11 hour journey in business class for only 28,000 miles each way. That’s a good one! Excellent value if you could find availability. another awesome post. what i like about your post is, it is very detailed and thank you for this thoroughly research report. Any sweet spot from Singapore to Istanbul or Vienna for SQ redemption? Im looking at the Star Chart and See Southeast Asia to South Africa at 150 RT in First. Can I route this through Europe and hop on the SIN-ZRH flights inbound and outbound and try to snag Singapore Suites both ways in addition to ZRH-CPT or something like this? Not sure if routing would allow that but it seems that most flights would have to go through Europe to get to South Africa? Woudl be a steal for 150k RT with a stopover in Europe? You can’t do that.. that’s called ‘back-tracking’, in SQ-speak.. you’re not permitted to ‘go-further’ as a route to a ‘nearer’ destination.. Unlike a ‘JAL-hack’ that (for now) allows you to redeem a one-way SIN>nrt>KUL, which is an ‘almost-return’, with just you needing to find-your-own-way back from KUL>SIN.. but fantastic value for a SIN>KUL redemption via NRT.. If you’re not familiar with this hack, it will take a bit of deducing..
Hey Ken.. thanks for the reply.. then How would I get there on SQ Star Alliance chart? Through Australia? Hi Ken, I managed to find SIN-MUC-IST route available for business class on a mixed SQ and Turkish Airlines redemption. I’m intending to book this, with MUC as a stopover, but wont this be considered backtracking? I’m not sure why this route was suggested in the site? I’m so sorry Andrew, I addressed it to Ken instead of you. Got a bit confused in the comments thread.